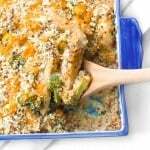 Nothing says comfort food better than a creamy chicken, broccoli and quinoa casserole made with fresh and healthy ingredients. Preheat oven to 350°F. Grease a 9-inch square casserole dish. Season sliced chicken breasts generously with salt and pepper. Heat olive oil in a large skillet over medium heat. Add chicken breasts and cook 3-4 minutes on each side, until browned. Set aside. On the same skillet, melt butter over medium heat. Scrape the brown bits off the bottom of the pan. Add onions and sauté for 1 minute. Add garlic and sauté for another minute or 2 until onions are soft and translucent. Add in flour and cook for 1 minute until lightly browned. Whisk in the chicken stock and milk. Bring to a boil and add parsley. Cook for 2 minutes, continuously whisking. Turn heat down to low, add broccoli and simmer covered for 3 minutes. Stir in quinoa, chicken, Greek yogurt, 3/4 cup of the cheese, salt and pepper. Toss to combine. Spread mixture into the casserole dish. Bake for 12 minutes. Sprinkle the remaining cheese and the Panko bread crumbs on top. Bake for another 5 minutes until cheese in melted and top is lightly browned.